Spin the wheel to get a discount today. Spin the wheel to get a discount. Looking for a Cheap Photo booth hire in Melbourne? Looking for quality photo booth hire for an affordable price? Here is why you should call Cheapest Photobooth Melbourne. When you are on a budget and are looking to add a bit of fun, excitement and entertainment to your next event consider booking with Cheapest Photo booth Melbourne and with lots of party props so your booth photos are the best memories you and your guests will take away from your Wedding, Birthday or any other event or party. We provide the best value-for-money photo booths in Melbourne. What is Cheapest Photobooth Melbourne? Started in 2017, we have grown very quickly to become one of the biggest photo booth companies in Melbourne. We have a fleet of Enclosed and Open photobooths. Our customers hire photo booth from us for many events like Birthdays, Weddings, Anniversaries, Corporate Events, Company parties, Office Christmas Party Photo Booths, Concerts, etc. Most of our work comes through referrals because people love our photo booths when they see it at their friends, family or company events and parties. Our customers love the fact our photo booths are so simple to use, the booking process is very easy and best of all they get the cheapest price when they hire a photo booth from us. You can see our Google Reviews here. Over the short span of time we have already delivered hundreds of happy smiles and funny poses at our photo booths. We dont just bring photo booths to your event, with our props, customised print designs, friendly staff and quality we bring a lot more excitement and fun to your event. Our Awesome Photo Booths are the answer to your question how can I make my party fun for everybody? 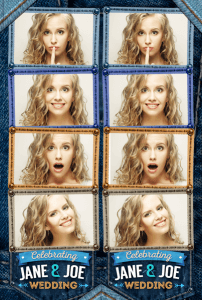 Cheapest Photobooth Melbourne provides both Enclosed and Open Photobooths. 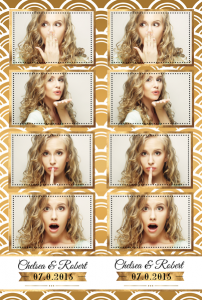 We have a fleet of 6 photo booths that we provide in Melbourne. Our Enclosed and Open Photo Booths both use a DSLR camera and touch screen to provide you with the best quality, professional photos at your events and parties. Our photo booths use flash lighting with is built into the booth to provide you with quality photos even in dark places like nightclubs and function halls. How to Get Customised Prints or Custom Photo Strips? As a part of our packages we offer your customised prints or custom photo strips for all our hire packages across all our photo booths. We provide you with a gallery of our ready templates or we can design one specifically for your event. Once you place an order we consult with you to understand your event theme and venue decor, etc to come up with a custom design for prints and photo strips. Many people assume just because we are budget photo booth hire company in Melbourne we don’t provide this service. We believe in smart, lean and efficient business processes and thats why we can provide custom design prints and photo strips to all our customers. Most of the time our customers leave it up to use to provide them with some custom designs that works for the. Some of our popular designs include the ‘Black & Gold’, ‘Denim Theme’. We believe in providing quality service at best prices and that includes almost all inclusions that you might get from any other photo booth company in Melbourne including custom design prints and customised photo strips. Fun awesome props are one of the most important things that make a photo booth experience memorable. At Cheapest Photobooth Melbourne we are always on the hunt for unique fun props. In fact, we enjoy shopping at all the local shops looking for interesting props for our customers. 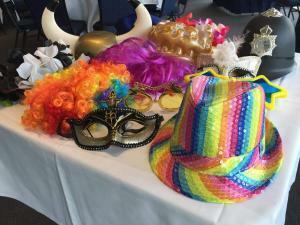 Our unique collection has enabled us to create photo booth themes in line with your event theme. Like we provided some awesome fun photo booth props for a Japan themed Birthday party. 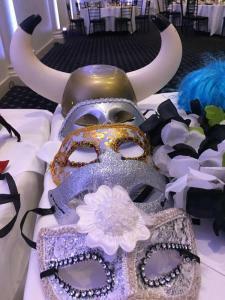 One of the most common themes we have catered for is the Masquerade event. All our packages include these awesome photobooth props so call us with confidence knowing we will bring along lots of fun props when you hire photo booth from us. Photo booths have evolved with times. Gone are the days where you would only get prints or pay extra for digital copies. Nowadays you can share photos on social media instantly. All our photo booths come with social media sharing options which means you can post your photo booth photos on Facebook and Instagram instantly from the booth itself. Not just social sharing but you also get digital copies of all photos from the photo booth at your event on the cloud after the event. Which means after the event you can see how your guests enjoyed at the photo booth, relive the memories of the day and share the photos from your mobile, tablet, or Smart TV with ease. With features such as photo filters, instant print, height adjustment, and a very wide range of party props we ensure you and your guests are having loads of fun at your party. 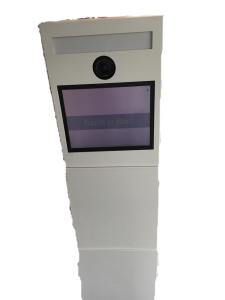 All our photo booths are simple to use, they all come with touchscreen so you touch the screen and it gives you a countdown so your ready with your glamorous pose and a fun prop to take a picture and then choose if you wish to print the photo or share on social media simply email yourself from the touch screen photobooth itself. We provide a professional and friendly service to all suburbs of Melbourne. All you have to do is give us a call to get cheap photo booth rental for your next event. Ideal for small space and height adjustable for kids and adults. Hire Latest Technology Photo Booth at the Most Affordable Prices. And we mean it. If your can find a cheaper price in Melbourne, feel free to contact us. We’ll knock off 10% of any quote you’ve been given in the city. No matter the season or the event. Cheapest Photo booth Melbourne is always ready to make your party fun and entertaining. We design and print every event name on every photo taken. Hire a professional photographer to capture your event for an additional fee to make your affordable photo booth experience even better. Our state of the art photobooths are fit for small and large spaces and are easy to adjust for any heights. At these prices, payment will be your last concern: credit card, PayPal, EFT or cash. We are driven to provide best service and quality photos at most competitive photo booth hire prices in Melbourne. 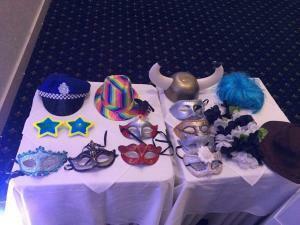 All our Photobooths come with lots of props to make your party fun and happening. Every time you rent one of Cheapest Photobooth Melbourne’s equipment, you are in for a lot more than that. We provide all kinds of props so that even the shyest one jumps into the fun. Contact our team and give it a shot! Hire a cheap photo booth from us today and let us bring the fun.